We intended to climb Granite Peak, Montana's highest summit over Labor Day, but the fire season had other plans. After an evening in Red Lodge we decided instead to summit nearby Whitetail Peak. It was nearly as high, but more of a scramble than a climb. Michael, his friend Eric and I made the journey. The highlight of this climb for me was oddly enough not the summit but the wonderous lake we camped at with a perfect name "September Morn." More alpine lakes should be badged so eloquently. Yes, there are two photo albums. Here's why. 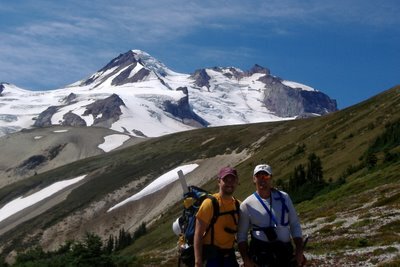 A few years back I climbed Rainier with Mike, Joe and some of his buddies. It was a private trip that Joe organized and amazing, but it lacked authenticity to a degree because of route selection. We climbed the main Disappointment Cleaver route. Why would this matter? 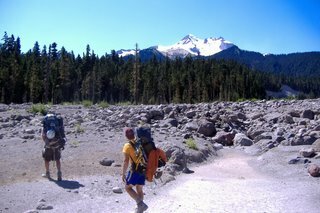 Well, the DC is flooded with every yahoo who wants to go up Rainier and the large guide groups fill the trails with I am sure some very capable climbers and bunch of morons. RMI is probably the worst and march a whole school trip up the mountain in double-time to their abilities with the sole purpose of dropping half the group at the top of the cleaver 3,000 odd feet shy of the summit. Then of course, with the pack thinned they slow. But this isn't a rail against RMI, but instead the whole canning of mountaineering and backcountry travel into something consumable. It is repulsive. 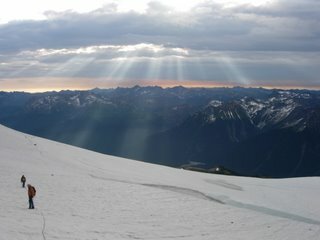 The uncanned experiece is what made our Glacier Peak climb so outstanding. We climbed it from the eastside, a longer approach that isn't frequented that often. 30 miles of dirt road to Trinity, followed by 10 miles backpacking by trail then another 7 off trail with sections of unmaintained trail (if you could find them) and then you're ready to start actually climbing the 10,000 vertical feet to the summit. On Rainier this would be the parking lot. We didn't drive there though, we walked and scrambled and looking up at the mountain we realized that sleep was not in our future. So we took a quick nap for a couple hours and started out again at 7PM. 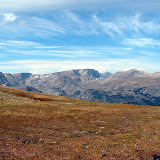 But unlike Rainier with trail wide enough to pass cars on we faced a bushwack for several thousand feet to the treeline. We made it there around midnight. After a very cold uncomfortable nap in the heather for a couple more hours in our wet clothes we resumed our climb reaching the edge of the Cool Glacier around sunrise and the summit by 9AM. Generally this is a time for celebration, we learned from this climb it is more of an intermission. We took a different route down then we went up (I know elementary mistake) but the first two-thirds of the descent were so much easier! And then we reached the steep slopes, which turned to absurd slopes, which turned to sheer cliffs. After a lot of skirting, and five miles of ridiculous bushwacking we finally stumbled into basecamp a solid 24 hours after we left. That's a real experience. No groups of 30 and no rangers or medievac to lean on. Just you, your companions, and the mountain. Pictures are geo-tagged, take a gander at the map view (switch to Hybrid or Satellite View).